Planning to promote your business or sign up customers at an event? Read four tips for a successful and stress-free stall holder experience. Exhibiting an an event or fair is an excellent way to build your brand and reach new customers. Since we launched Talented Ladies Club we’ve exhibited at a number of events, including the Work and Family Show and Mums Enterprise. But simply paying for a stand and turning up isn’t a guarantee your efforts will pay off. In order to maximise the return on your investment (and enjoy the experience) it’s important to prepare properly. Erin Thomas Wong from Making Mumpreneurs, and founder of The Cocoon online members club shares her advice with us. My husband has just launched his new business and for the first time in years we set off to do a stall at a fair to promote it. All the memories came flooding back of all the years I would stand there with my Smallprint jewellery stall, promoting Pitter Patter classes, and organising the Northfields Night Markets with Ealing Mums in Business. I learned a lot from doing these events and it was great to share this with my husband as he was getting ready for the fair. So I thought I would create a blog post to share the four biggest lessons I learned for a successful and stress-free stall holder experience. Don’t try to wing it – if you have an event coming up get yourself organised and think about it at least a few days before to make sure you have everything you need. If you leave it until the last minute you are likely to forget something important, and that will make for a very stressful day! Payment machine/forms (always have a back up if using a machine or tablet). Photo frames with images or text on. If an outdoor event, carry large pebbles to hold flyers down in the wind! Believe it or not, not everyone will actually approach your stand close enough to see what you do. Think about your own habits at markets, especially if you’re chasing kids around. Can someone see what you do from a few meters away? I don’t mean can they see your logo – I mean can they see what your business is about? This is why banner stands, table banners, A-boards, branded balloons are all so important. Make sure your tagline explains clearly what you do – don’t be cryptic! I know it’s so tempting to play on your phone when you’ve been standing at an event for hours, but please don’t! The same goes for chatting between yourselves intensely if there are two of you. I can’t tell you how many stallholders have complained about not getting any business, but in fact they are totally unapproachable and look uninterested in the customer walking past! Remember, people buy from people. Always have a smile to attract passers-by. Not everyone will want to stop and chat – don’t be offended by that – but at least give them the opportunity of starting a conversation by making eye contact with them. Think about what you’re wearing – branded tops are fantastic as it makes you look much more professional. For Smallprint I had a branded black apron which I loved wearing. As my products were quite crafty as I made the jewellery myself, it was a great fit. Could you wear your brand colours perhaps? Yes of course ideally, we want people to buy from you on the day, but realistically this may not be the case, especially if it’s a considered purchase. Exhibiting at events like these are always a marketing and branding exercise more than anything else. Make it clear and easy for them to do this. Have a photo frame with the information you want (perhaps more than one) and say it to everyone you speak to. 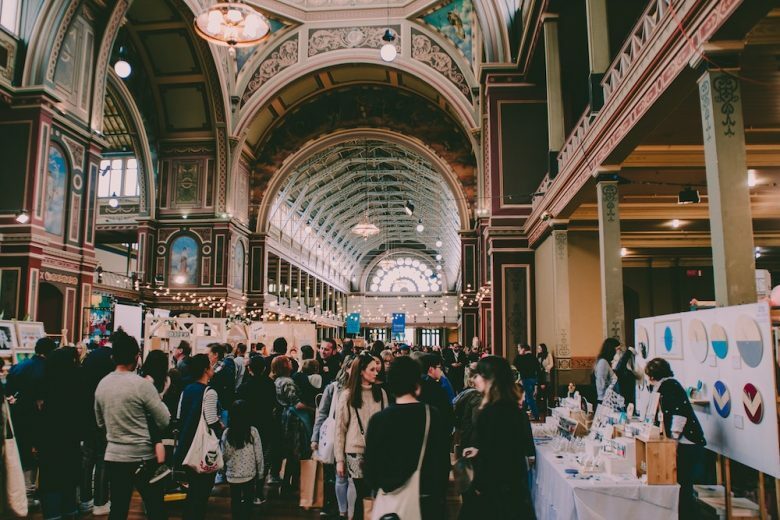 Attending events as a stallholder can be a great experience, you get to meet your customers face to face and build relationships, as well as make great contacts with other business owners. Don’t waste your time by attending these events when you haven’t got all of the above sorted and clear – it’s your job to convert those visitors in to customers so make sure you are making the best impression you can. If you would like more help with your marketing and sales, take a look at The Cocoon online members club which offers masterclasses on mapping your customer journey from stranger to fan, marketing your business on a shoestring budget, creating awesome content and much more. Plus promotion for your business and continual support all from the comfort of your own home.